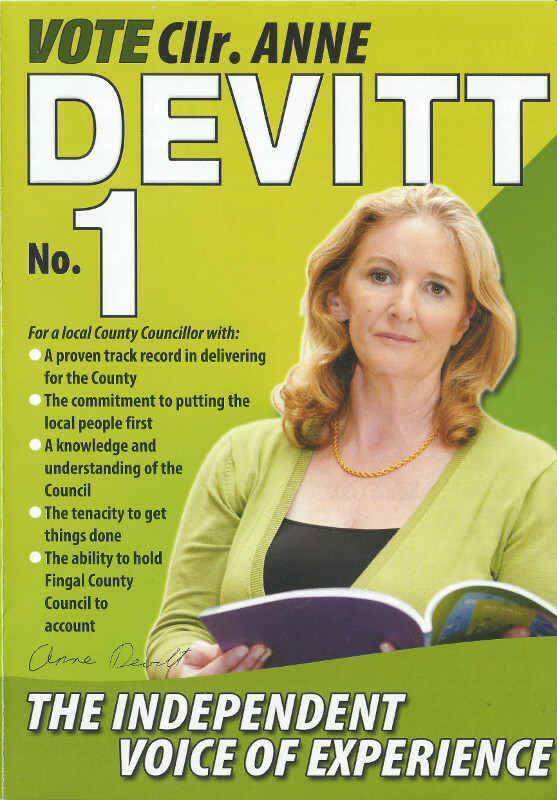 A leaflet from Anne Devitt who is running as an Independent in Swords for a seat on Fingal County Council. In 2012 she resigned from Fine Gael in the wake of the findings of the Mahon Tribunal. Interestingly she asks for transfers to Fine Gael candidates and a vote for Brian Hayes in Europe. “Why Vote Independent?” A leaflet from longstanding Councillor Ruairi McGinley who is running as an Independent in Rathgar Rathmines for a seat on Dublin City Council. 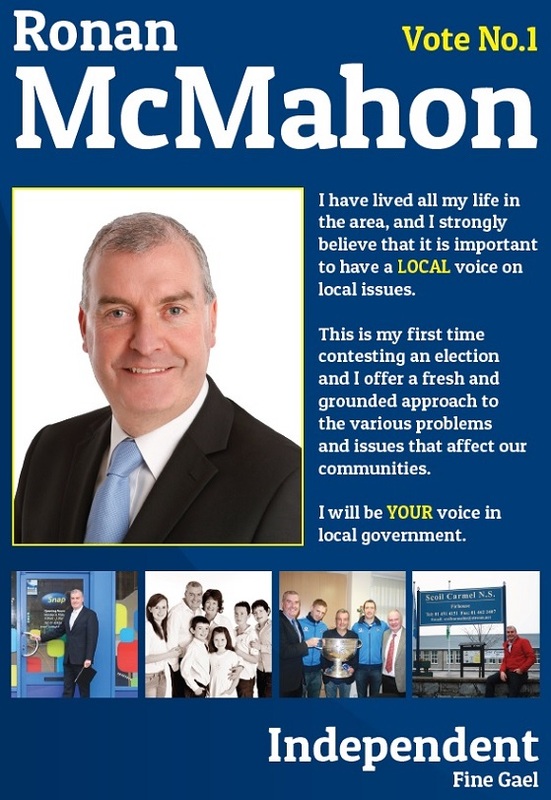 A new leaflet from Independent Fine Gael candidate , Ronan McMahon , son of former Fine Gael TD Larry McMahon who is running in Templeogue Terenure. A leaflet from Independent Donie Rua O’Sullivan who is running in South and West Kerry for a seat on Kerry County Council. A flyer from Fine Gael councillor Ruairi McGinley who is running as an Independent in Rathgar Rathmines for a seat on Dublin City Council. 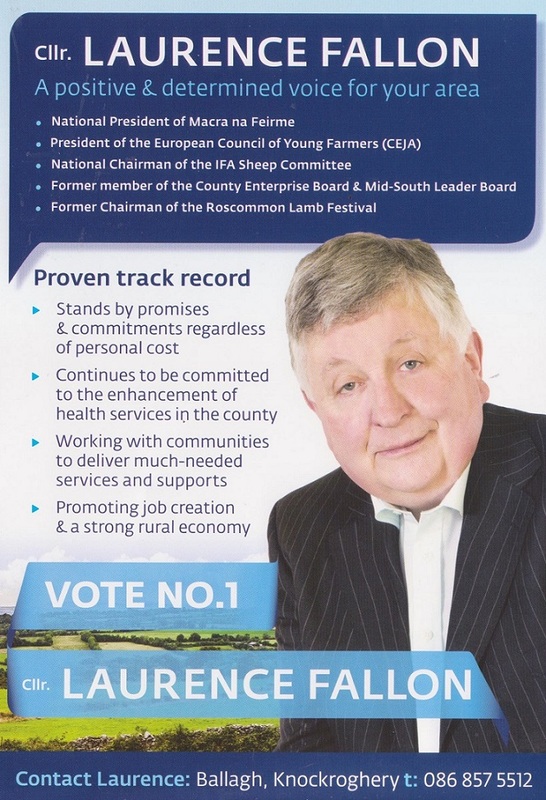 A leaflet from former Fine Gael and now Independent Denis Naughten endorsed Councillor Laurence Fallon who is running in Athlone (Roscommon) for a seat on Roscommon County Council. 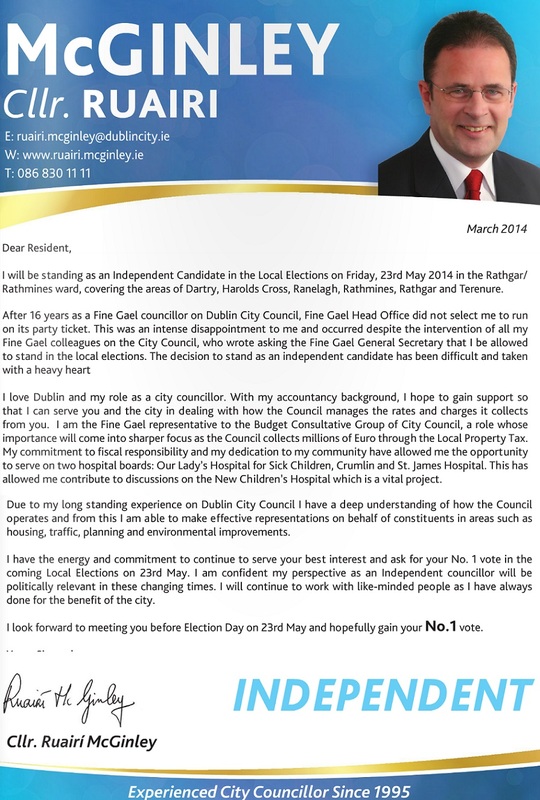 A letter to voters of the Rathgar Rathmines ward from current Fine Gael Councillor and former General Election candidate Ruairi McGinley. In the letter he explains how he was not selected to run for Fine Gael , despite 16 years as a City Councillor and how with a ‘heavy heart’ he has decided to run as an Independent.